Almost a year has passed since the eruption of yet another cycle of protests and revolts across Iran, this time by the country’s Working Workers, Unemployed Workers, low-paid workers and the poor (for the purpose of this document, Iran’s dispossessed, or the Mostaz’afan). In the time lapsed the country has persistently been the site of struggle for many protest actions and strikes by various strata of the society particularly the labouring classes. The recent protest actions further suggest the political reality of modern Iran is by no means a fixed one but rather a fluid, open, evolutionary political reality capable of giving birth to realities present stakeholders, myself included, may not fully forecast. Nevertheless, this paper is an attempt at capturing a moment in the turbulent life of modern Iran: a country in flux and ripe with hope and potential as well as repression and regression. By reviewing the past year in the context of the strikes and protest acts of the Haft Tappeh Sugarcane Factory workers (from here on referred to simply as Haft Tappeh), I aim to shed light on the state of political (in)stability of the regime in Iran and introduce a thriving movement not simply for a taken for granted class, but a viable “alternative” moving forward for the entire country. It is my contention in this piece that the discourse of the striking workers of haft Tappeh has radicalized over the course of the past year moving from pay and benefit grievances to a mandate to run the organization via collective workers’ councils. My preferred phrase here is “radical”, however, in North America where I reside, this word has been ascribed a negative connotation to allude to social destruction, chaos, and general collapse of civilization. Therefore, I feel compelled to clarify my position and explain that I use the term in the Marxist sense of the word and in a progressive, revolutionary tradition of the far Left. Additionally, I will use collective councils, communes, or soviets interchangeably throughout this text to convey the complexity of the phrase Showra. To that end, I will explore the discourse of radicalization primarily around their demands to manage the means of production or collective councils of the workers, but also around the syndicates’ position on women. 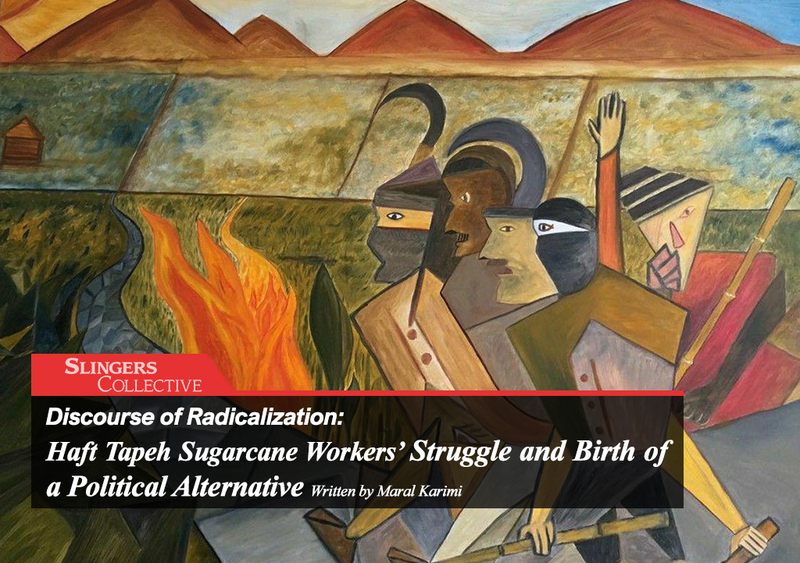 My main source of empirical material for this preliminary study is the videos, statements and other files on the official telegram channel for the Haft Tappeh Sugarcane Workers Syndicate. But first, a brief history of Haft Tappeh. Haft Tappeh Sugarcane factory was established in the early 1960s in the oil-rich province of Khouzestan, as a public entity and managed to be productive and successful over most of its life. The company is significant in that prior to the reduction of the tariffs in in 2005 (from 150% to 50%) it produced the majority of the domestic sugar needs (For further reading please see here.) . Following the reduction of tariffs, the successful company began experiencing significant decline and was consequently taken over by the private sector. the successful company began experiencing significant decline due to mismanagement, misappropriation of funds, and embezzlement amongst other things. Over 3000 were laid off in a matter of 3 years Conditions that lead to the strikes of the past year. Studying the progression of the demands of the syndicate representing the workers reveals that originally in the Fall of 2017 when the bulk of protests begins, the workers go into temporary work stoppage across the vast organization demanding better wages, backpays, benefits, and revision of unfair hiring practices. At that point most hadn’t been paid for four months or more, a practice that had become routine for the new owners. Moreover, while everytime the workers went on strike a limited measure of their demands were met including some of their backpay, majority of agreed upon grievances were ignored. However, not only working and pay conditions didn’t improve over time, the workers and later some media sources discovered a potential scheme by the new owners to dismantle the organization and sell its most valuable assets: the 24,000 Hectares (close to 60,000 Acres) of land. Around early December 2017 is when first instances of evolution of demands begin to surface and the syndicate releases statements and videos indicating they no longer simply ask for their backpays, but also for Siamak Afshar, the then CEO of the organization, to be removed and more significantly, for the organization to be de-privatized and move back under public ownership. This video is dated December, 11, 2017th and for convenience purposes shall be referred to as V1 from here on. In V1 and V2 dated two days later we hear Esmail Bakhshi, in his capacity as the leader apparent, allude to the concept of workers’ councils , nevertheless, the buck stops there and there is little to no detail about the function of such collectives. What we want to say today is different than before…if our demands are not met by the end of this week, we don’t want our demands anymore we will take haft Tappeh back! (crowds cheer)…we have come to say today that you can’t run Haft Tappeh anymore and we don’t trust your lies anymore…if by the end of this week our demands are not met we will occupy the management ourselves and will rebuild and manage Haft Tapeh ourselves…we will run Haft Tappeh until we find capable managers who can run the company… Haft Tappeh is our heritage. [Esmail Bakhshi] has once again brought forth the topic of “workers’ self- management” in the workers movement. Whether or not the haft Tappeh workers, or any other production center in crisis, are capable of operationalizing “running” said production centers in crisis under current conditions in Iran, must be studied…However, suffice to say, workers’ self-management is the exact opposite of capitalist mode of management and an inseparable movement from workers’ lives and labour struggle across the world. Workers’ self-management maximizes profit for the workers’ in the production center. Though the language above is still soft and riddled with doubts justifiable under the circumstances, one can’t help but notice a progression in the class consciousness and demands of the group. Over the next few months we see little activity in terms of strikes, although there are few work stoppages far and apart until August 2018. Domestically however, a lot is happening. President Trump cancels the JCPOA deal, Rial devaluates dramatically, and strikes, riots, and street protests, though scattered, are almost a daily occurrence in Spring and Summer of 2018. More importantly the private owners of Haft Tappeh are on the run for they face charges of embezzlement and corruption. Not surprisingly, a new round of strikes begins on August 18, 2018 which marks a new beginning for Haft Tappeh. Our red line is private ownership of the Haft Tappeh land holdings. The real shareholders of the Haft Tappeh are the people of this region and the workers of Haft Tappeh. To bring the institutionalized corruption in the country under control the only way forward is to form citizens’ and workers’ councils, oversight on the government and government institutions. We have started this in Haft Tappeh. The above excerpts tell the story of a labor movement whose mandate is slowly but surely radicalizing and whose raised consciousness is steering it into becoming a class for itself, a class aware of its interests as well as conflicts. Similar assertions and statements regarding returning the company under public ownership of the government, halting sale of Haft Tappeh land holdings and particularly workers’ soviets continue throughout the various strikes and protests for the rest of August, September and October. November 5th marks the beginning of the most recent round of strikes which are still in effect on the date of writing these pages. The new round is the most compelling not only because it has gone on for over a month with no end in sight, nor because many of the leaders including Esmail Bakhshi have been detained, but because the mandate has further evolved into a radical alternative. On November 8, 2018 (V6) while on strike, Esmail Bakhshi took to the makeshift podium again to make a historic speech in which he directly implicated the Islamic regime as well as the government of President Rouhani in creating the conditions that delivered devastating results for the working class. Because, he affirms, the incessant corruption and embezzlement are the “direct results of their chosen economic system”. He details the government’s complicity in the private sector’s scheme to dismantle Haft Tappeh with no regard for the thousands of workers, their families and the regional economy dependent on their wages. What is evident from Bakhshi’s speech and the responses from the crowds is the elevated sense of understanding of one’s class positioning and interests. More importantly, this goes to prove my previous point regarding the Haft Tapeh workers becoming a class for themselves for what they exhibit now through these documented moments captured on video is a clear sense of the class struggle they’re engaged in. A class conflict manifesting not simply with the novo rich who own the organization, who are part and parcel of this regime, but the neoliberal policies of the government that has ruled in the name of the dispossessed. Despite the supposed ideological divide between the two factions of the regime (Reformers vs. Hardliners), the working class has been left to fend for themselves against the devastating economic policies of consecutive governments with the implicit blessing of the Supreme Leader. But what I am pointing to in no uncertain terms, is the fact that this very same class is arriving at a point where they are now drawing clear lines separating their interests from those of the ruling elite, no longer buying the “Republic of Mostaz’afan” rhetoric. Our alternative is councils and collectives. We are not individual-centered…those seeking an individual, and the nationalists, and the racists and the regressive-minded should stay away from us. Our alternative is workers’ collective councils. Following this speech, the slogan which since January 2018 uprisings had been “Bread-Jobs-Freedom” quickly morphed into “Bread-Jobs-Freedom-Workers’ Councils”, a direct departure from placing an “ask’ and clearly offering an alternative or a way of life. One measure of the significance of this historic speech is the fact that it has now officially entered the public discourse as evident from social media and other accounts, even pushing the exiled Crown Prince Reza Pahlavi to allude to his proposed form of government as potentially a social democracy. Women are yet another signifying factor distinguishing Haft Tappeh from other similar strike actions. In almost all videos posted on their official Telegram channel, Esmail Bakhshi is the sole speaker addressing the crowds. The two other times that someone other than Bakhshi addresses the workers, it is a female labourer ( V1 & V6). The presence of this leading female figure is a significant moment in the workers’ struggle since her articulation breaks women out of their familiar gendered grievances and roles and presents them as simply “workers”, not necessarily female. This is not to suggest Haft Tappeh is suddenly the feminist Utopia and no longer a male dominated masculine environment, but it is cultivating progressive political acts to build that ever elusive solidarity with other oppressed groups, including bringing women into the firing lines of the battle. For this truly is a battle we’re engaged in with the capitalism armed with religious, misogynist ideology. In other words, it is opening the space, albeit briefly, for female workers to appear in public personifying their ‘selves’ as a sugarcane factory worker. Disrupting our imagination of a factory worker as a male figure and unleashing the potential for re-imagination of a more gender conscious workplace. Despite my search I haven’t been able to determine to a reasonable level of certainty the gender divide in Haft Tappeh workers. As such we are in the dark as to the what percentage of the workers identify as female. Even though women have demands and grievances which are particular to women, including freedom of choice of attire, divorce rights, freedom of choice, and …., at the end the class warfare the workers are engaged in will be impossible without the active presence of the hardworking female workers. On the one hand such statements describe the awareness, at least on the part of the leadership of the movement, of the necessity of solidarity between all oppressed groups if they are to overcome the capitalist grip. On another note, the practical implications of such inclusive acts of solidarity are the potential they unleash for the rest of the labour movements across the nation as well as for the women’s struggle in general. So far, Iranian women’s struggle has been largely dominated by the interests and grievances of the middle and upper middle class women. Utterly fair, reasonable and justified grievances such as freedom to choose one’s attire, equal rights in divorce, custody and inheritance matters and so on. However, from an intersectional perspective, female labourers obviously have an added layer of oppression, one which they share with their male labouring colleagues. In other words, because of their class positioning both genders face exploitation at the workplace and in that they seem to be locating a common bond. A bond which has every potential to fracture a far more powerful one: the unholy marriage of capitalism and male supremacy. Needless to say, capitalism, and by extension neoliberalism, hinge on the domestication and the cheap labour of women, and on their place in the socio-economic hierarchy as lower beings or second class citizens, but outbursts of agency such as the above, have every potential to break those structures, by taking the first step and representing female workers in a none-gendered role. Such is the profoundly progressive measure of relationship that Haft Tappeh has chosen to have with the struggles of women. Lastly, I feel compelled to underline the fact that this analysis is by no means collapsing the multi layer oppression these women experience into a unified construct of “worker” by reducing their struggles to class warfare. On the contrary, class struggle, while dominant, is one in the multitude of layers of oppression these women experience including gender, race, ethnicity, sexual orientation and so on. As I detailed at the beginning of this piece, the political reality of modern Iran is fluid and in flux forcing the different social classes to increasingly look for a way out of the current economic and political crisis that show no sign of improvement. In other words, both the different strata in the country and the opposition in the Diaspora are exploring alternatives to the current system. Reformists who are currently in power and are clearly the favorite of the Western capitalist administrations have been widely rejected by the people. “Hardliners- Reformers-The game is over” was one of the most popular yet meaningful slogans of the December 2017 uprisings which alludes to the loss of legitimacy of this faction in no uncertain terms. Popular unrest as well as hosts of domestic and foreign crisis have compounded to challenge the hegemony of the Reformers as a democratic alternative. Ironically, this break in the hegemonic grip of the Reformers did not come from politicians and oppositional figures home and abroad, it came from the dispossessed and the forgotten on the grounds. I have discussed the theoretical and practical bankruptcy of the Reform doctrine in my previous work and so will refrain from going into further detail here. Furthermore, the continued unrest and crisis of the Iranian regime have flushed out many previously dormant opposition groups into becoming publicly active once again. One such example is the former Crown Prince, Reza Pahlavi, and the newly formed political group Farashgard Iran (The Iran Revival) which is closely affiliated with him. Though Reza Pahlavi remains intentionally vague on the details of his intended form of government (Monarchy vs. Republic), I am inclined to dismiss his claims for I believe the people of Iran have spoken four decades ago about where they stand on the institutions of Monarchy and the anecdotal evidence coming from Persian media in Diaspora, is simply that and nothing more. In addition, Farashgard and Reza Pahlavi are staunch advocates of neoliberal economic policies including the private sector and foreign investment in Iran which are precisely the cause of Haft Tappeh’s current predicament. Mojahedin e Khalgh (People’s Mojahedin or MEK) must also be mentioned, who despite their promising beginning at the height of the 1979 revolution, are now largely an Islamist cult with socialist tendencies, despised by the people for their perceived treason during Iran-Iraq war. Additionally, there are a whole host of other secular and democratic tendencies that are yet to organize and form a formidable adversary, should the political energy last. Without the support of their base, the IRI will operate on shaky foundations, for the regime will be absent the appearance of legitimacy necessary for it to survive domestically. The alienation of the working class hasn’t gone unnoticed and the workers are responding in creative and revolutionary ways, i.e. mandating collective workers’ councils to run the means of production. It is in the context of ownership and dominance of the means of production that we must explore Haft Tappeh and the encouraging alternative they offer. Considering Reza Pahlavi and Farashgard, the MEK and even the ruling Reformers as a viable alternative, means a class other than the labouring classes will dominate the means of production. In other words, the status quo which is highly oppressive to the working class will continue, albeit under a different form of political authority. The alternative that Haft Tappeh is suggesting though, is ruling from below, one that is organically formed by grassroots initiatives of the labourers who have come to appreciate their class interests will infinitely be at odds with those of the ruling elite. In essence, the working class is offering the nation an alternative, a way out, for none of the above scenarios can guarantee their interests and bring massive change to a country hungry for such, as dominating the means of production. Despite the fact that Esmail Bakhshi is in jail and tortured, and despite the fact that the workers are the daily targets of intimidation and manipulation both by the government and the private owners, the movement is enduring with strength. Gradually, we are witnessing different strata of the society, though scattered and far and apart, joining the struggle and declaring solidarity with the workers of Haft Tappeh: other workers’ syndicates, teachers, students, and so on, and so must we as activists, journalists, academics and otherwise classed and politicized beings. My aim here was to capture the present moment in Iran’s history in this piece while aware and alert to the possibility that with modern Iran, conflicting outcome are real possibilities. However, in this instance time, struggle, and above all solidarity will bring the unforeseen, the silent and the taken for granted of political struggle in modern Iran into clear and resolved relief.